Police say they have arrested and charged a male suspect for a shooting that left two people critically injured in Brampton on Thursday night. The incident occurred at around 8:30 p.m. in the area of Clementine Drive and Pergola Way. Speaking with reporters at the scene, Const. Bancroft Wright said five people were inside the home at the time of the shooting, including three adults and two children. A man believed to be in his 60s and a woman believed to be in her 40s were both taken to a trauma centre following the incident to be treated for their injuries. A suspect was located in the area of Ray Lawson Boulevard and Hurontario Street in Mississauga at about 2 a.m. Friday. Police say he was detained without incident. “Investigators at this time believe that it is an isolated incident as the suspect is known to one of the residents,” he said. Police said Friday the accused is a 41-year-old man. He has been identified as Gurpreet Araich of Brampton. He was charged with two counts of attempted murder, two counts of aggravated assault and several firearms offences. A bail hearing is scheduled for Friday. 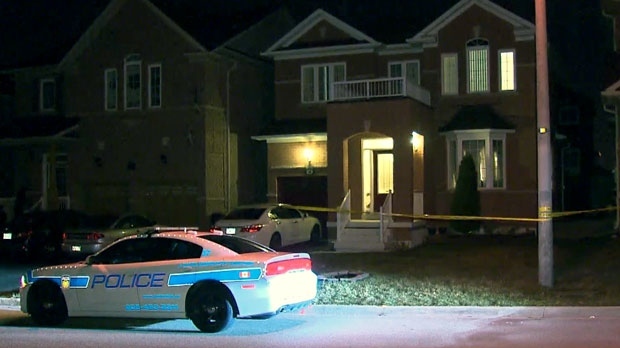 Peel Regional Police are investigating a double shooting in Brampton.